I had heard of this event, which had been curated by Pritha Sen about a year and half back, when it was hosted in Delhi and Kolkata. 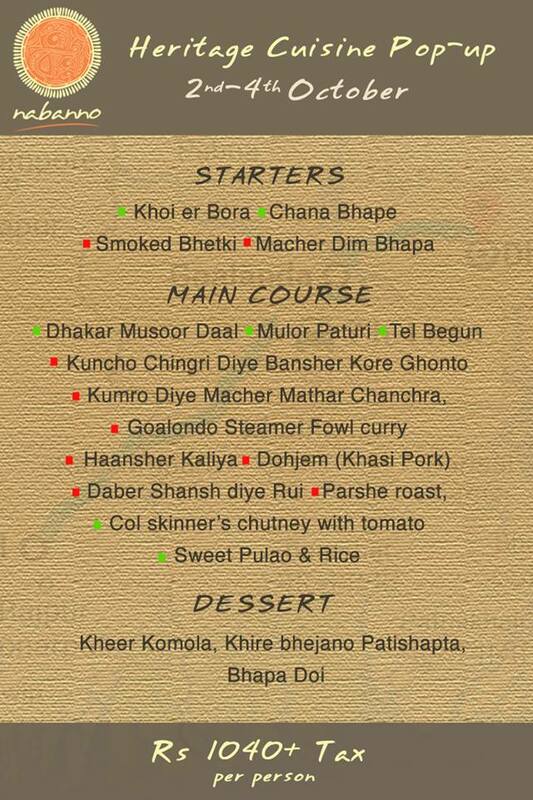 A few friends who attended the pop-ups had told me that this was a celebration of vintage East Bengal cuisine. Being a Bangal by origin, I was familiar about the famed Goalondo ghat at the confluence of Padma and Brahmaputra in Bangladesh, and had some knowledge of the delicacies which were served during the overnight steamer ride, which ferried people travelling from Kolkata to North East and Burma across the East Bengal rivers till the 1960s. The food as per references made by some of my uncles and aunts during my childhood was simple yet delicious. When Subhasis decided to host this three day event, I was elated, as this would give me an opportunity of undertaking a culinary journey to my roots. The menu which was sent across looked very interesting and offbeat – ranging from Khoi er Bora to Haansher Kaliya. On my first visit for a preview, we met Pritha Sen who explained that the menu has been designed incorporating dishes which were popular in East Bengal and beyond, the favourites of the people who used this steamer service, as well as the boatmen who prepared the meal. The centerpiece of the event was the Goalondo Steamer Fowl Curry, a light preparation of country chicken, cooked with basic spices by the boatmen who hailed from East Bengal and Burma. 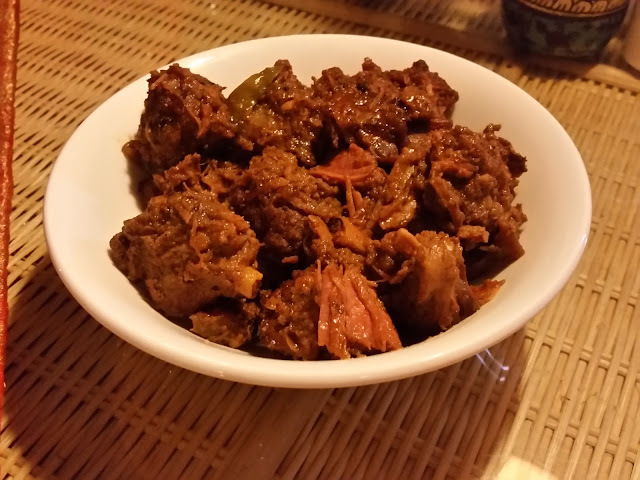 The jhol looks a bit oily, but to your delight you do not feel any excess oil when you savour it with rice. 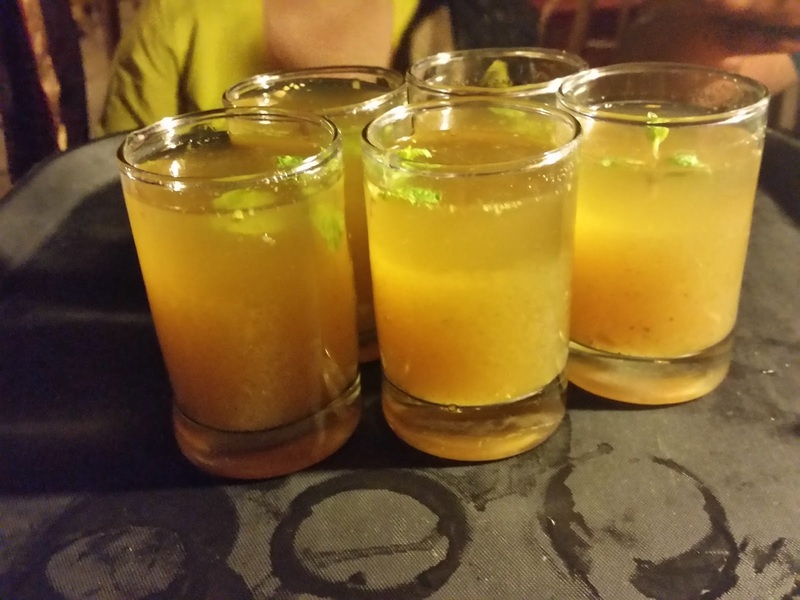 Pritha had never tasted the original version, but took the pains of recreating it based on musings and descriptions from the generation who were fortunate to travel on this route. 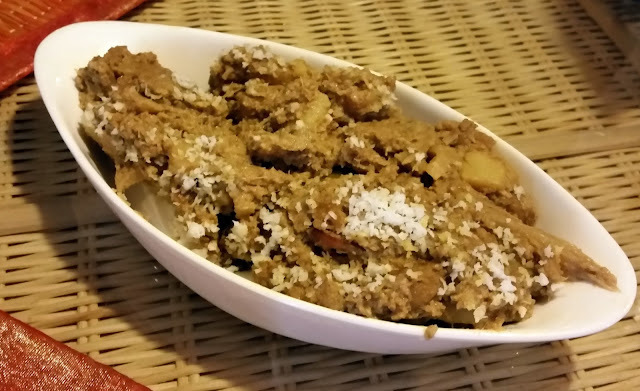 Her version uses very few of the standard masalas used in Bengali cuisine. A major differentiator is use of dry shrimp paste in the curry with red chillies and chopped garlic pods, which imparts a zing to the taste of the curry. 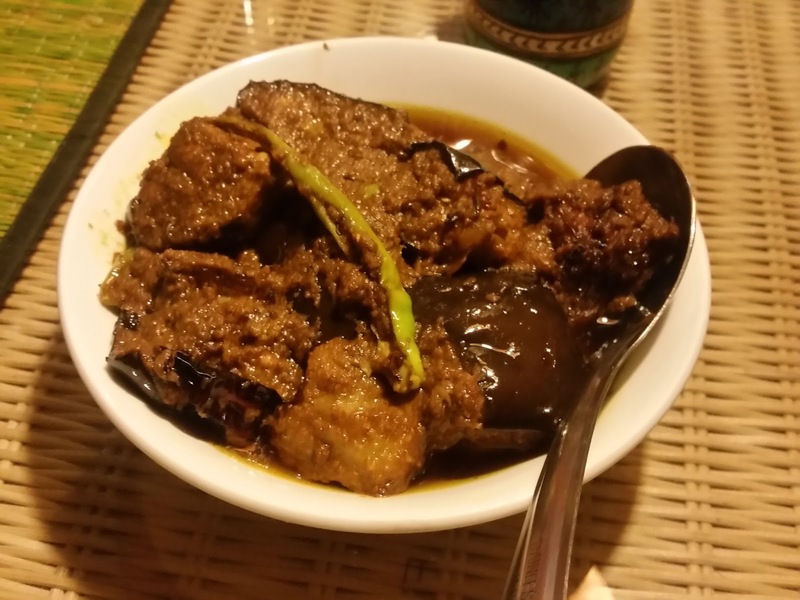 I think Syed Mujtaba Ali the famed Bengali writer whose repeated mentions of this dish in his books inspired Pritha would have loved her creation. 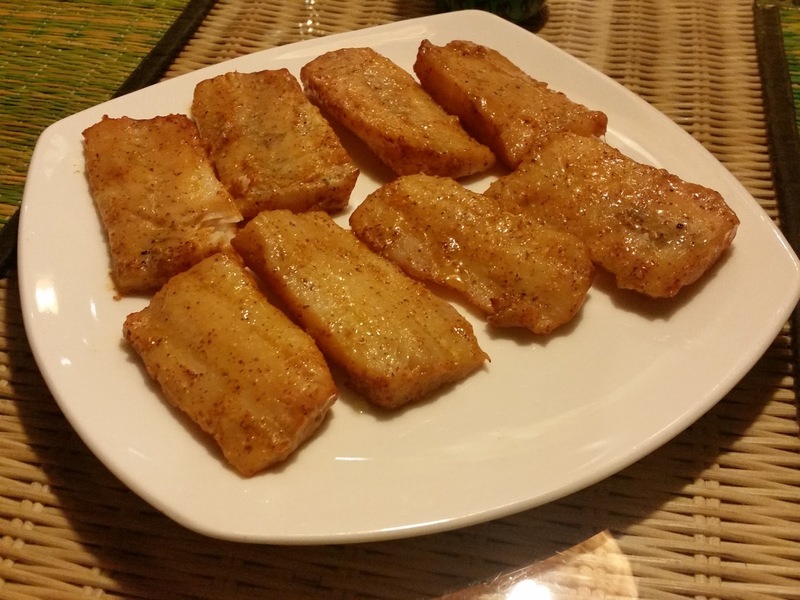 The second distinguished dish in the menu was again from the steamer – the Smoked Bhetki. With application of a marinade of light spices and butter, the smoking is done in an unconventional way which Pritha had adapted from an experienced Arakan chef. The process comes from our grandmother’s generation – with a combination of puffed rice and molasses replacing the husk as the smoke agent. The result is a rustic smokey flavour which is unique and markedly different from the firewood version. For me the fish tasted even better with a generous helping of extra butter on top and a dash of lime juice. 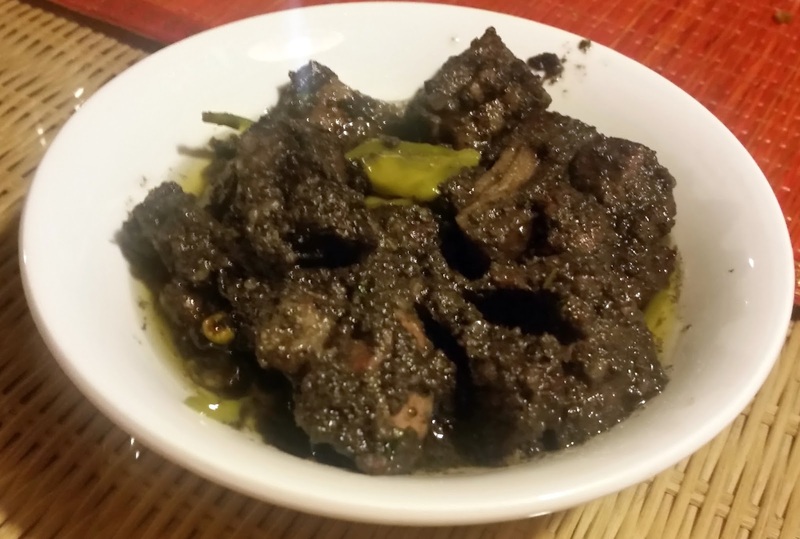 Many of the travelers on the steamer used to continue their journey by road to Sylhet and beyond to Khasi Hills (now in Meghalaya) and the Dohjem or Pork prepared in Khasi style with sesame seeds was a tribute to them. I had tried this dish in the Meghalaya stall at Dilli Haat before, but the dark gravy here was a winner with rice. I believe apart from meat, this dish is very popular with a version that uses liver, kidneys and intestines of pork or beef. 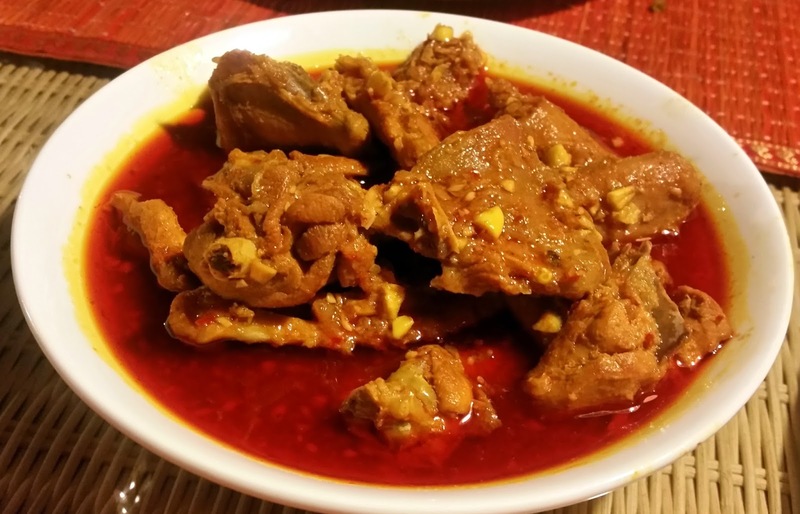 On my second visit to this pop-up, I had the Hasher Kaliya – a duck preparation. The spices in the preparation was optimum and the Mishti Pulao served with it complemented it well. The slow cooked duck was not chewy at all, as is normally the case at many places. I am a huge fan of fish roe. The Macher Dimer Bhapa had very little oil in it. The fish roe is mixed with a little bit of oil, khus khus and masala, and then baked inside a leaf. Normally we savour our fish eggs fried, and this provides a very healthy alternative with enhancing the typical taste of macher dim. Among the vegetarian items, Mulor Paturi was a revelation. Normally paturi is with a mustard oil and paste based marinade wrapped inside a leaf and steamed, but this was done on a tawa. As a result this was much drier than the other version and served as a perfect side with the simple tomato and green chilli based Dhakar Musur Dal and steamed rice. I also tried out the paturi straight with rice and some mustard oil to add an extra zing, and it worked out rather well too. 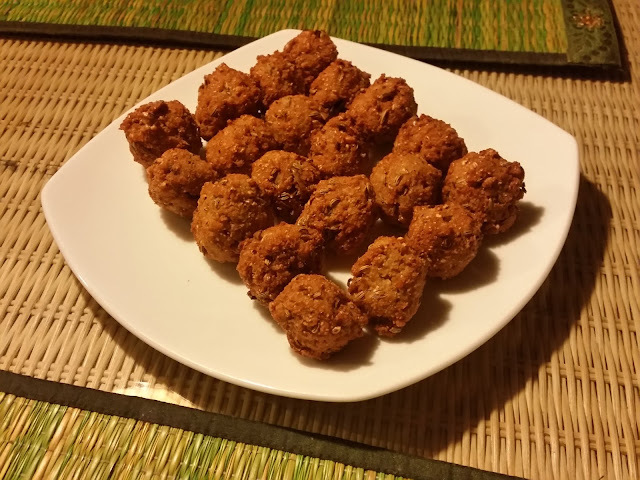 The Khoi-er Bora was another offbeat preparation - pakodas of khoi (or popped rice) with coconut, green chillies and fennel seeds. The Tel Begun or eggplants in oil has a masala based on fennel seeds which made it very flavorful. 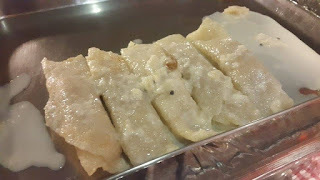 Some parts of East Bengal use a lot of saunf or mouri in their cuisine, and this was pretty evident in quite a few of dishes here. The chutney was also special. Colonel Skinner, a British army officer who is known for raising a British cavalry regiment in 18th century is credited with the recipe using mangoes, tomatoes, raisins, garlic pods and sliced ginger. 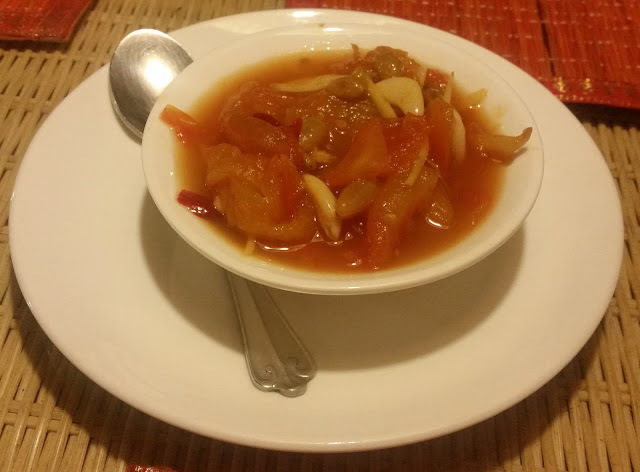 Here in Hyderabad mangoes were not available due to off season, and so the chutney was mainly tomato based. Other items worth a mention was a welcome drink Tetuler Sarbat made from tamarind which was very refreshing, and Pritha’s take on the Bengali Bhapa Doi. 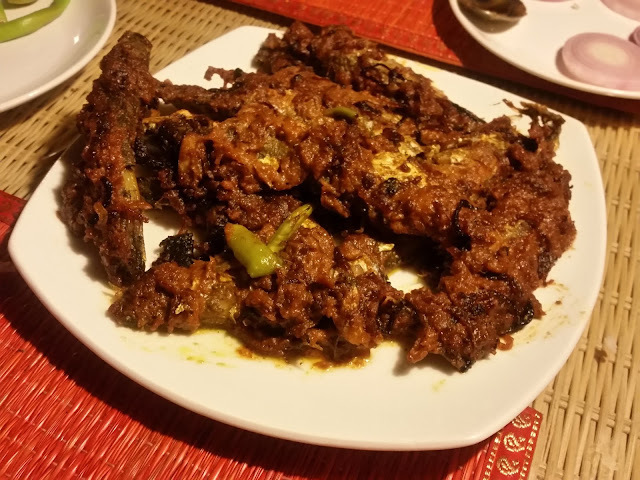 The Kucho Chingri Diye Basher Kore Ghonto had a striking similarity to the Eromba of North-Eastern cuisine sans the chillies. However Pritha clarified that it is a preparation from Dhaka. 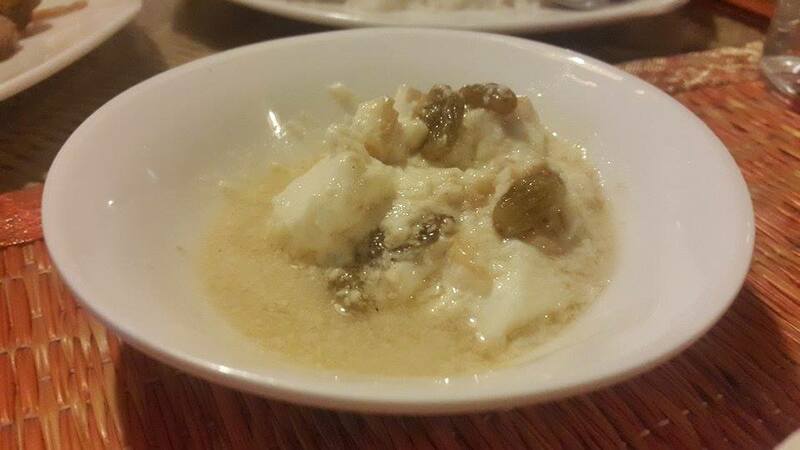 For fish lovers, there were Parshe Roast and Daber Shorshe Diye Rui – a preparation with tender coconut. As the regular readers of this blog know, I have a penchant for trying out exquisite meals and have chronicled a few others here. This was definitely one of the best for me. I loved the way the pop-up have been designed around a theme, and the dishes have been curated after diligent research. When Pritha Sen was talking about her creations, one could really feel her passion for the cuisine. This is an event which will be enjoyed by connoisseurs of East Indian cuisine, and you will never get this stuff in Bengali restaurants and normal Bengali food fests. And finally a big shout out for Subhasis and Paramita of Nabanno. 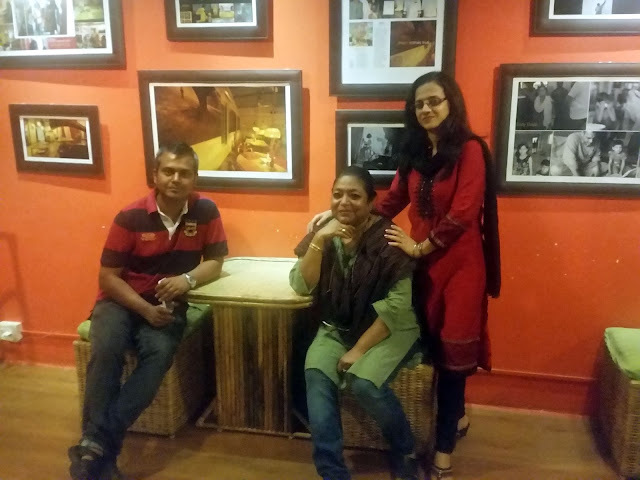 I have always appreciated their love for the East Bengal cuisine and the experimentations that they do. Organizing this pop-up was a giant step forward and we will definitely expect more such events in future. Amazing event. Awesome food! Am sharing this. All these dishes look amazingly delicious!